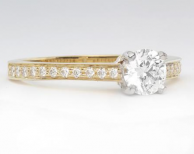 An eternity-style engagement ring, this setting is both delicate and attention-getting. 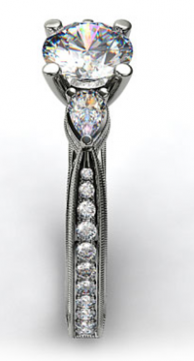 0.54 carats of pave diamonds cover the entire band in a rounded, pave setting. 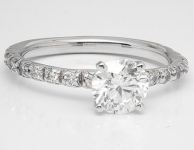 This contemporary style ring attracts compliments and will bring a smile to her face. 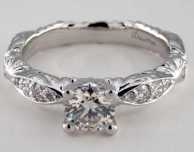 Choose any shape diamond to set in the center of this ring! 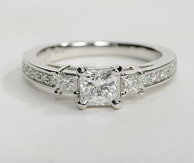 Here you get two princess cut sidestones and pave diamonds on all THREE edges on either side. This means a super sparkly ring from all angles! 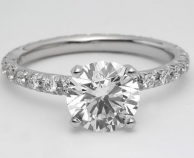 Customize this ring to your desire with a center diamond of any shape or size. Win! 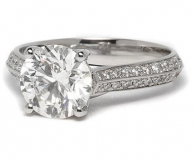 Beautiful ring that’s sure to make your center diamond pop! 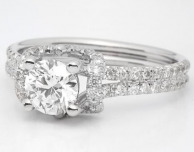 This beautiful, vintage-inspired engagement ring has a pave diamonds that are lowered slightly below the edge of the platinum band. This band on this ring is on the thicker side, so it's also great for engraving. 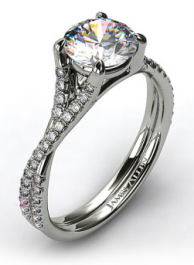 This ring can be set with any size and shape diamond. 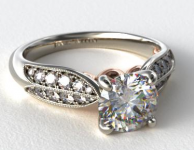 This vintage style engagement ring includes pave diamonds and a milgrain texture to showcase the center diamond of your choosing. The price is great on this ring, too! 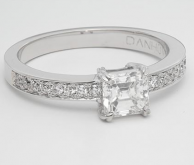 Simple but elegant engagement ring with a thin band with pave diamonds embedded to make your center diamond stand out. Versatile and budget-pleasing, this is a great choice for smaller, delicate fingers.